Cook sushi rice according to package directions. 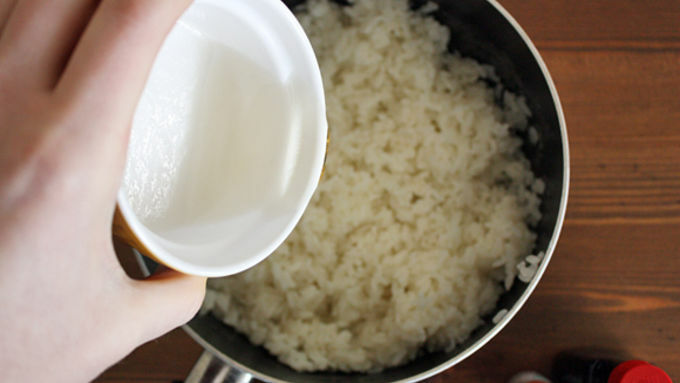 Combine rice vinegar, sugar and salt in a small bowl. Microwave 30 seconds, then pour warm mixture into cooked rice. Fold mixture into rice until incorporated. Divide rice among four resealable plastic food storage bags. Add about 10 drops of food coloring to each one (red in one, blue in another, etc). 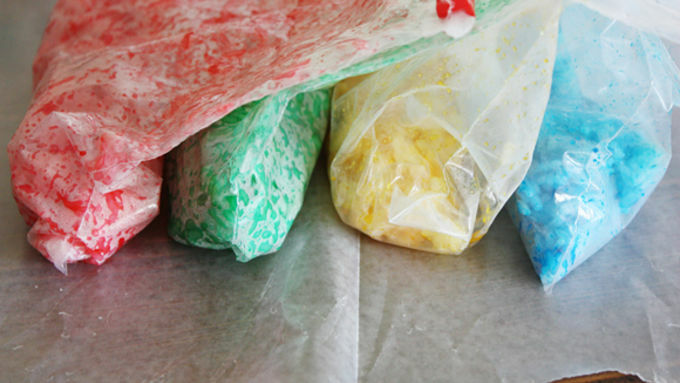 Seal bag and carefully use fingers to incorporate color into rice. Open bag and let rice sit a few minutes to absorb color. Carefully fold colored rice together in a large bowl (OR, leave separate and arrange on nori in layers). 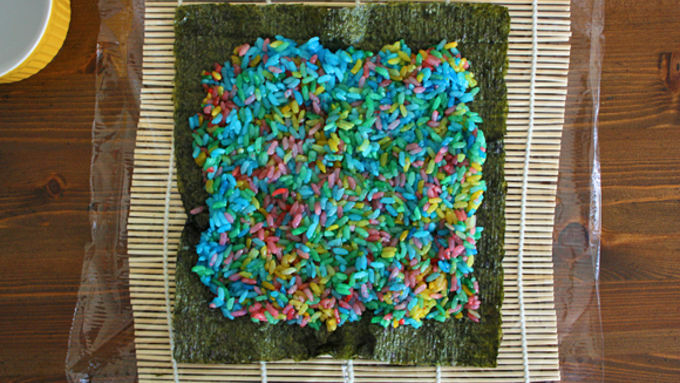 Place one sheet of nori on top of a sheet of plastic wrap on top of a bamboo sushi mat. Wet fingers and top nori with a third of the rice mixture. Carefully press rice into a flat, even rectangle leaving a 1-inch border around the edges. Place two strips of avocado, carrot and imitation crab along the bottom third of the rice/nori. Carefully roll up nori in the plastic wrap and sushi mat, pulling plastic wrap away from you with one hand while pulling rolled sushi mat toward you with the other hand to tighten the roll. When roll is fully rolled, use a little water to seal the edge of the nori. Use a very sharp knife to slice roll into 3/4-inch thick slices, cleaning knife between cuts. Repeat steps 3-5 with remaining rice, nori and filling. Arrange sushi on a plate and serve. There are two types of people in the world: Those who love sushi and those who don’t because they haven’t tried good sushi yet. I’m firmly in the former crowd (sushi is officially one of my favorite things about life), but I wasn’t always – in fact, the first time I tried a California roll, at a swanky, upscale Japanese restaurant, one of those where it’s eerily quiet and everyone’s dressed up all business casual trendy-like, I gagged on it LOUDLY and spit it out right.on.my.plate. Then I ran to the bathroom and died. Thankfully, sushi and I are on much better terms now, and while I’ve never shown my face again in that swanky Japanese restaurant, I’m able to get my sushi fix plenty of other places – including my own kitchen. It’s true! It’s one of the easiest (and tastiest) things you’ll ever make at home. But these rolls aren’t just any rolls, as you may have gathered. Oh no. 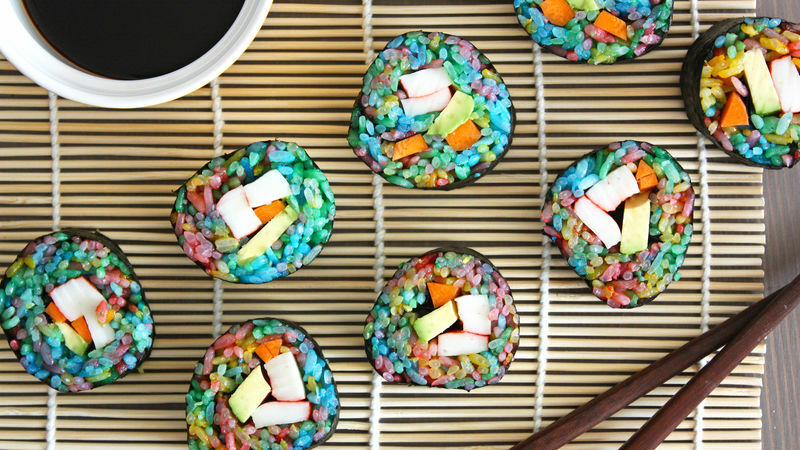 These are Rainbow Sushi Rolls, ladies and gents. 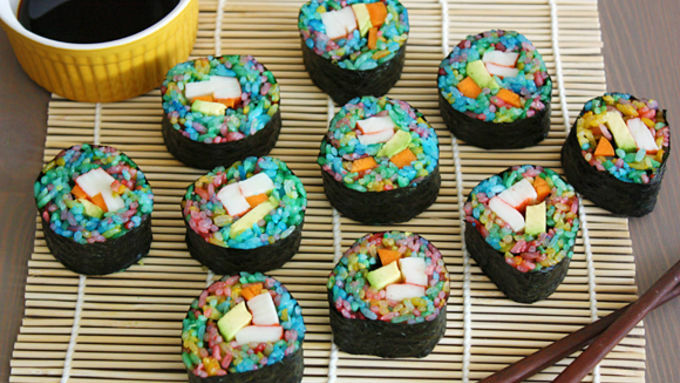 We’ve got rainbow-colored rice all rolled up in these babies. So not only can you impress your friends by making homemade sushi, you can blow their MINDS when they see that it’s all rainbow-fied. BAM. It’s best to prepare everything ahead of time when you’re making sushi so you don’t get hung up on slicing the filling ingredients n’ stuff when you could use all that energy to focus on making the perfect roll (but don’t worry – it’s not that complicated anyway!). 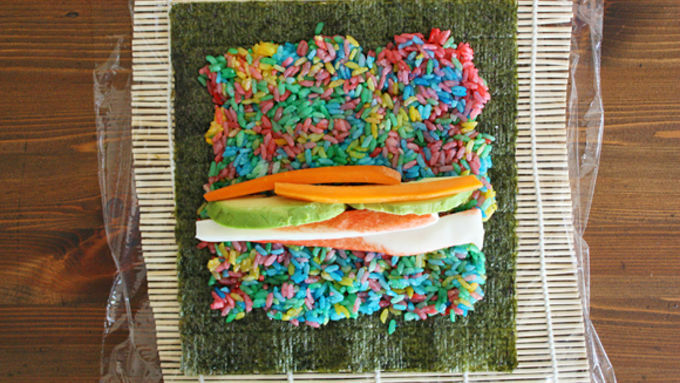 I mixed the multi-colored rice together but you can leave the rice separate and layer it on the nori for more of an actual “rainbow” effect rather than the tie-dye situation we’ve got going on here. Up to you. I filled my rolls with imitation crab, carrots and avocados, but feel free to use whatever you fancy – cucumber, bell pepper, salmon, cream cheese, etc. Serve the rolls immediately. Watch them disappear. 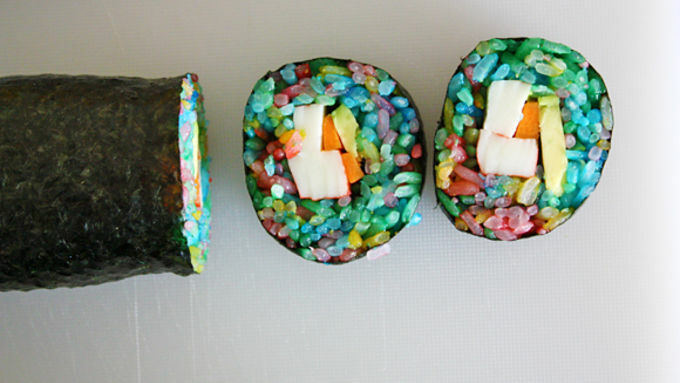 Be prepared to feel the urge to make homemade rainbow sushi again and again.